Kevin's wedding present surprise build! Welcome to TeardropForum.com › Forums › Teardrop Builders’ Forum › Kevin's wedding present surprise build! This topic contains 9 replies, has 4 voices, and was last updated by teardropkevin 1 month, 2 weeks ago. I have been lurking on teardrop trailer forums for a couple of years now. Not really knowing what to build or what style or which plans to choose from. I was lucky enough to run across Fritz’s build journal on a different teardrop forum which led me here. I instantly felt in love with the Chesapeake trailer kit and that’s what I plan to build. My fiance and I are planning to get married about a year from now (September 2019) which I believe will give me enough time to finish this project. She currently lives in Canada and we are not able to see each other as much as we like so hiding the project from her is not going to be an issue at all….at least for now. I’m terrible at keeping a secret so that’s the only thing that will ruin the surprise. My big mouth haha. I plan on giving this trailer to her (us) on our wedding day as a surprise. 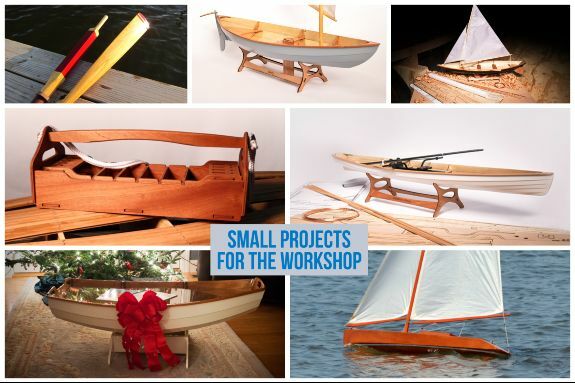 Kind of a cool story about how and where I’m building this. I live in a quaint little cabin that is very small and has room for only one person. I have no garage, no space to build this at all. Before I could commit to this project I knew that I needed a place to build the darn thing. I decided to knock on some neighbors doors because I kind of live out in the country and I thought maybe someone might have some barn or garage space they could rent me. Lucky me! The first door I knocked on was just a little bit down the road and Bill was more than happy to rent me a huge space for $100 a month. I can be there as long as I need to be and he has shown great interest in my project himself. It’s secure, has lighting and I even have water available. So….my next hurdle to overcome was the trailer issue. I even started a thread about it. 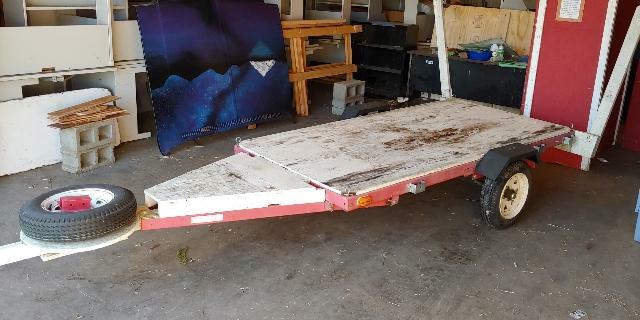 I wished so badly I could afford the trailer that Chesapeake offers or even a Northern Tool trailer but I’m trying to save some bucks here and there and the cost of the trailer would make or break the ability of building the thing in the first place. Found my trailer last weekend! 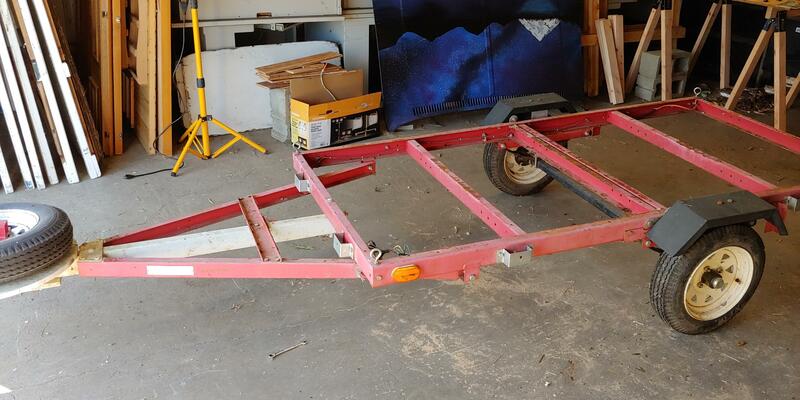 It is a used Harbor Freight (everyone’s favorite, lol) 4′ x 8′ foot trailer and I bought it for $200. It has a spare tire which is nice. I’m attaching some pictures of it. He had some plywood on the top and painted it white and had some weird extensions for the lights because he carried kayaks or something. 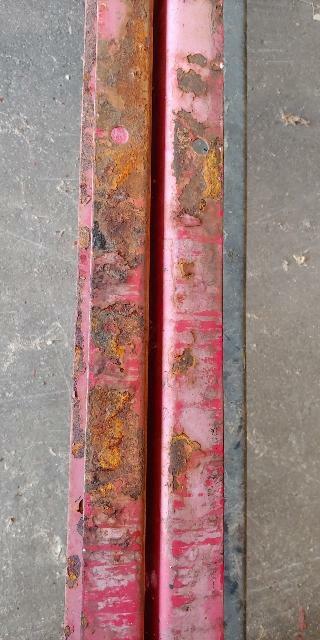 Today I removed all of the crap and I was a little worried because of some rust underneath but after some light sanding it seemed to come off fairly easily. I’ll have to repack the wheel bearings, repaint the frame, buy some new wiring…I hope this still ends up as being an okay deal because it’s looking like I’m going to be putting some work into it. But Chesapeake is supposed to put their trailer kit on sale any day now and apparently it’s supposed to be on sale until the end of October so I do have some time. I’m trying to budget and get the rest of my money saved up so I can pull the trigger before the sale is over. In the meantime I’ll work on getting the trailer ready as much as I can. I’m sure I will learn a lot once I get the “bible/manual” but one question I had was regarding painting. 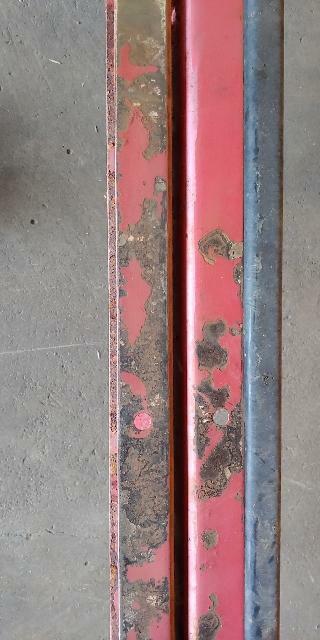 I’ve seen a few folks paint the the the bottom few inches a certain color (along with the underside itself) and I would like to do the same and have it match the paint I put on the trailer. I’m assuming spray paint is what I would use on the trailer but I’m trying to figure out how to match the color to what I would paint with a brush on the bottom of the trailer? Probably too early to worry about that but I will be painting the trailer before the kit even arrives probably so it’s something I have to figure out soon. Another question comes to mind…it’s obvious that he built the trailer in the folding mode option and I don’t believe any teardrop plans are recommended on putting a trailer on it in that configuration. I need to figure out how to reassemble it in the non-folding configuration. At any rate welcome to the beginning of my build! This reply was modified 7 months ago by teardropkevin. 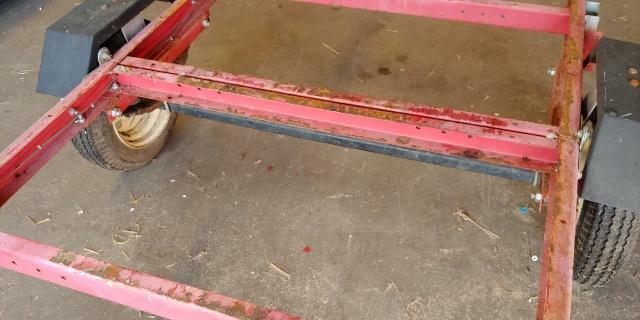 Should I completely take apart the frame of the Harbor Freight trailer to repaint it? I’m assuming the answer is yes because I want to get fresh paint and all of the screw holes to prevent rusting, etc. ??? You can. On, the folding part you just add a couple of bolts to help hold it together. To fold the trailer you have to remove some bolts. Finally starting to get my shipment from CLC. Friday I got the hardware and epoxy boxes. I should be getting the wood boxes early next week! I’ll start looking at what else I can do during the current weather conditions that doesn’t involve fiberglass or epoxy. If anyone else has suggestions I’m all ears. Good Luck with the build. I started in November in an un heated garage (in Maryland). I use a propane torpedo heater to get up to temperature and then use 3 electric heaters to maintain the temperature over night. On the colder weeks here, I’ve avoided epoxy work but when it gets warm (any temp above freezing) this scenario has worked well. The place that I’m renting out from my neighbor can be better described as a barn. It is huge but there’s a lot of his crap in it. The ceilings are probably close to 30 feet high and the length of the space is probably about the same. I would say it’s about 25 feet wide. I built a room within a room hoping it would contain the heat. I used 2″ x 2″ s and painters thin plastic drop cloth. Covered all the sides and even the top and it reminds me a bit of Hannibal Lecter LOL. I did a test about a week ago and left the heater in there overnight and was only able to get the temperature about 5 degrees warmer then the outer temperature in the rest of the room. I needed to build this little room anyway even if the heat didn’t get up to where I wanted it to to work because behind this barn they do a lot with hay and there is a dust that seeps through the barn and it would have ruined any varnishing. So at least I’m set up for that. Those propane heaters are excellent although I did read that someone seemed to have an issue with a weird finish on their trailer after varnishing. Like black soot being embedded in the varnish or something? All I’ve been using at this point is a stand up electric heater that doesn’t blow anything because I’m worried about that. But it’s not really working. Kevin, did you make a double wall tent for your build? Not clear from your post, but if you put plastic up on both sides of your 2×2 walls that might help a lot. Kind of like a thermopane window. Unfortunately I did just a single “pane” of plastic and even the single wall of plastic is that extremely lightweight painters drop cloth type plastic. It’s so lightweight that when you walk by it, it moves. Thinking about putting heavy duty plastic on all sides feels like something I don’t want to tackle right now but I bet it would make a big difference. I’m afraid of doing it to then it not making a difference. The only heater I have to try to heat up the place is one of those portable radiator type heaters and I don’t think that it could heat up space that cold quick enough. So now I’m trying to figure out what I can do in the meantime and it doesn’t seem like a lot since you can’t really go to the next step before you finish the prior one. All of the rest of the pieces are still in the cardboard boxes with the massive amount of Scotch tape on them and I was thinking today that I could remove all the pieces, knock-off the little machine tabs that you see on all of them and kind of get that done.